In a lead-up to his first budget next week, Gov. 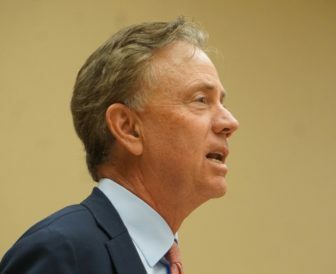 Ned Lamont asked Connecticut residents Monday to brace for a lean spending plan that overhauls service delivery, restructures pension debt and broadens the sales tax. The new governor also asserted that while Connecticut is poised for success, legislators should resist the urge to tap the state’s emergency budget reserves — which must be preserved to guard against the next recession. “I believe our state is poised for success, with new jobs on the rise, unemployment rates at historic lows, and the growth of established and emerging sectors from wind energy to biotechnology on the horizon,” Lamont wrote in an “open letter” to Connecticut residents. “I also believe that delivering on those opportunities requires a sustained commitment to fiscal stability that will allow Connecticut to turn the page on what’s been holding it back and give you, your employers, and your local governments the confidence you need to thrive. Connecticut has dramatically increased its emergency reserve — commonly known as the rainy day fund — over the past 12 months, from about $200 million to $1.2 billion. And some projections say the state could have as much as $2.1 billion in its reserves by this fall. But some of that growth is attributed to one-time changes in federal tax policy that are not likely to be repeated. And with Connecticut and the nation now nine years removed from the last recession, Lamont has warned repeatedly that the rainy day fund — the state’s fiscal cushion against the next economic downturn — should not be touched. But that doesn’t mean the administration won’t raise taxes. Lamont pledged not to raise income or sales tax rates, and said he wants to cut income taxes by expanding a credit that helps poor and middle-income families cover local property tax costs. But to close the projected deficits, Lamont also has said he would broaden the sales tax base by removing sales tax exemptions for certain goods and services. Earlier this winter, the administration researched ending long-standing exemptions for groceries and prescription medications. Lamont, who has recently downplayed the likelihood of taxing groceries, hinted Monday about another partial exemption. The fiscal crisis Lamont and the legislature face, in the short-term, involves finances that — without adjustments — are headed for major deficits in the coming years. And the single-largest factor behind those potential shortfalls are surging retirement benefit costs tied to decades of under-funding. “These fixed costs are not something that we can simply cut, as they are contractual obligations, similar to your mortgage or credit card debt,” Lamont wrote. His predecessor, Gov. Dannel P. Malloy, teamed with unions and the General Assembly in 2017 to adopt a plan to smooth spiking contributions into the state employees’ pension. Annual contributions to the state employees’ fund were once projected to exceed $6 billion by early 2032 — and then drop to a few hundred million dollars afterward. Under the 2017 plan, the contribution still would grow from about $1.3 billion this fiscal year to nearly $2.2 billion by 2022. But contributions also would remain above $1.6 billion, at least through 2046, as Connecticut makes up the deferred payments — plus an estimate of the investment returns it could have earned by taking relief now. The teachers’ pension fund faces a similar doomsday projection, with the annual contribution expected to jump from $1.3 billion this year to as much as $6.2 billion by 2032. And though Lamont didn’t name the teachers’ pension directly in his letter, he alluded to it. “In my proposed budget, I’ll suggest a path forward to finally address those (other) fixed costs and reduce the rate of increase,” he wrote. It’s unclear exactly how Lamont would achieve that. That’s because the state borrowed $2 billion in 2008 to shore up the teachers’ pension and pledged to its bond investors not to short-change pension contributions for the life of the 25-year bond issuance. Former state Treasurer Denise L. Nappier said that if the state wants to pay less into the teachers’ pension fund, it needs to pay off the bonds first. Certain Malloy administration officials disagreed and took a different interpretation of the bond pledge. Lamont has not said how he would address this legal issue.